‘The woman who puts sunshine on a plate’, is the complementary, and utterly deserved, title given to 2012 MasterChef winner Shelina Permalloo in this month’s (August) edition of Red magazine. Evoking sunshine from a dish draws us closer to pleasurable memories; of warmth, long summers, holidays and exotic foods. Sunshine makes us feel good; nature’s best remedy for boosting well-being and happiness. Fresh produce, whether grown locally or imported, is literally infused by pure natural sunlight. Every cell nourishes us from the inside and is more beneficial than man-made vitamin supplements. If you’re currently living – or existing, I should say – on a bland, processed modern diet of breads, cereals, ready-meals, fizzy drinks and endless tea and coffee then a switch to a more natural diet will enable you to feel more energetic, look younger, enjoy better skin, hair and nails. You’ll achieve a natural weight loss (or weight gain where necessary) and an all-round more cheerful persona. One of my oldest friends from primary school recently told me she admires my optimistic outlook and ability to turn any situation around to see the positive within. My children share a similar attitude, magnified recently during my eldest daughter’s elective spinal surgery where her strength in both body and mind filled my heart with pride and joy. While optimism may be a natural genetic gift, I truly believe that our approach to healthy eating plays a role in our physical and emotional strength. Putting Sunshine on a Plate is something I try to achieve in all our daily meals and snacks, and while we do of course occasionally eat crisps and chocolate (generally on the 5 hour ferry crossing to the UK mainland! ), our home meals are vibrant, nutritious, delicious and, best of all, inexpensive and easy to prepare. Don’t be afraid to try new produce. It really doesn’t matter which way you chop it, slice it, scoop it or cook it or if you serve vegetables for breakfast and fruit for lunch! Prepare all your meals, snacks, lunch boxes or picnics with love and care. This positive energy will flow through to the person eating it. Think about how a packet of supermarket biscuits or crisps make you feel compared to a slice of warm homemade cake at a friend’s house. Eat your food in a positive environment; lay the table, add a small jam jar with a few flowers picked from the garden, use your favourite crockery and cutlery. Avoid watching television but instead focus on eating calmly and slowly, use mealtimes for family conversation but avoid heated discussions and arguments at the table. Here are three simple meal and snack ideas to bring the sunshine into your kitchen. 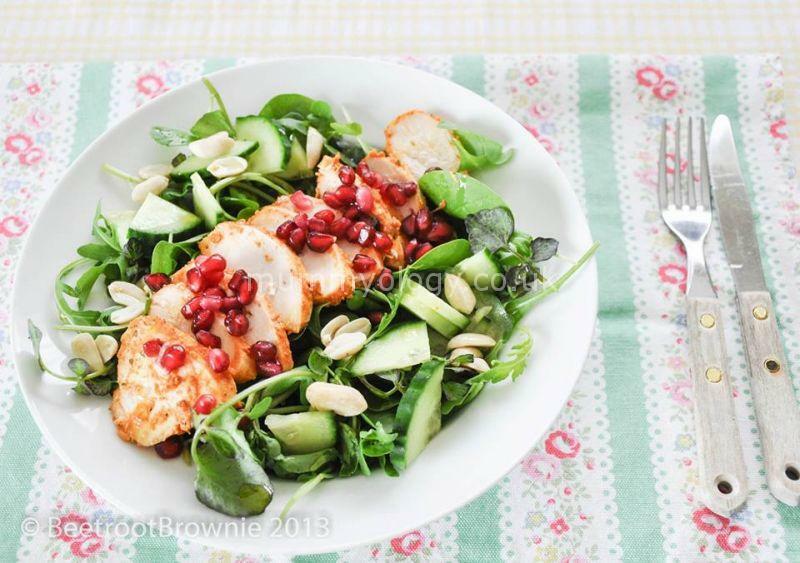 For more recipes and healthy, clean-eating inspiration, please visit my website www.beetrootbrownie.com or my Facebook page Lorraine Pannetier – Personal Trainer. 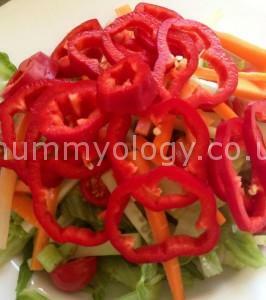 An eye-catching mix of salad leaves, carrot, cucumber, tomatoes and red peppers. Spicy chicken tikka with salad greens, cucumber, pomegranate and peanuts. 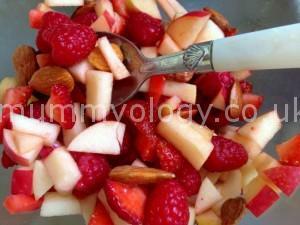 A nutritious blend of raspberry, strawberry, apple and almonds in fresh lime juice.